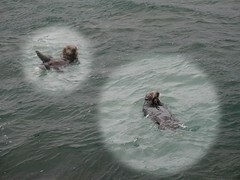 We saw this mother-and-baby otter pair outside the Monterey Bay Aquarium. They looked so happy bobbing along the top of the waves, eating their lunch. After S helped me with the PhotoShop close-up effects, I submitted this picture to cuteoverload.com. To my knowledge, they never posted it. Isn't it cute enough? You can click on the photo to see a larger version on flickr. While I'm at it, the dopey octopus is still waiting to be featured on Cake Wrecks and my yarn kitteh is still deep in the recesses of I Can Has Cheezburger. Feel free to help my efforts by nudging the site admins.